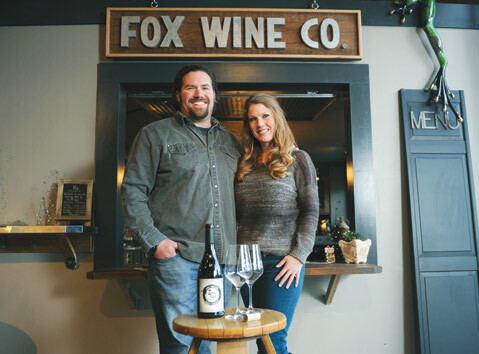 Winemaker Blair Fox (above with wife Sarah Fox). In a calendar crammed with food and wine events that raise money for worthy causes, Santa Barbarans struggle to select which to attend; however, if you rely on a formula that adds breathtaking setting with impact of the charity involved, multiplies that with the quality of purveyors, and then divides that by number of attendees, you’ll find the Fork & Cork Classic at the top of the list. Just in its second year — though somewhat a spinoff of the former Taste of the Nation event — the Foodbank fundraiser is May 3 at the Montecito Country Club, where the region’s top kitchens and booze makers will serve only about 600 people. This year, the event will honor winemaker Blair Fox (who makes Fess Parker’s many wines as well as his own personal labels) and Julienne restaurant’s Justin West (whose late father founded a similar event in Oregon 25 years ago). To get a better sense of the event, I sat down with both of them over a bottle of Clementine Carter saison-cider last week. Here’s what they had to say. 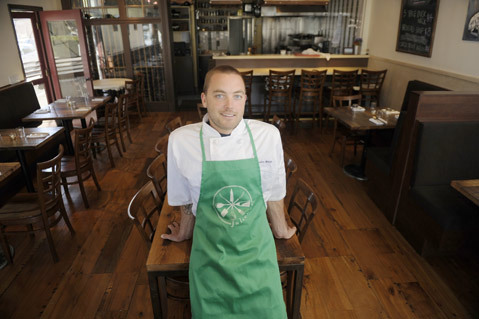 Julienne's chef and owner Justin West. Justin West: I got involved when we did a fundraising dinner for the Foodbank at Julienne and raised $3,200. We also took part in a James Beard national dish competition as the only Santa Barbara restaurant involved; L.A. was represented by 12 restaurants, San Francisco had 20, New York had 15 or something like that. We had to come up with a dish to serve for the entire month, with $1 from each going to charity. It was an Instagram competition, so to the city with the most hash tags won $10,000 for a charity of their choosing. We jumped into the fight, and somehow we won. I have no idea how it happened. It’s a real grassroots story. We galvanized the locals and beat out all the major cities in the country. We almost raised $14,000 for the Foodbank. Blair Fox: It’s an honor to be honored. I’ve given my Blair Fox wines for a Foodbank fundraiser dinner, but I think the award is about what I do with winemaking in this entire county. I make a lot of wine, 100,000-plus cases. Blair Fox Cellars is like 1,000, and Fox Wine is like 1,000, but Parker Station pinot is almost 30,000, and our Fess Parker Santa Barbara County chardonnay, which is a fantastic wine for the money, is 30,000 cases. My own stuff is where I try to keep my hands dirty, where I’m not just telling someone else what to do. I like to do the punch-downs, to be the one loading the press. At 100,000 cases, I can’t do it all. I came from that small winemaking background, and I try to keep it all like a small winemaker would, but I just have people to help out. JW: I come from a family that likes to give back. The restaurant’s business is about feeding people, but it’s a shame and an irony that we only care about feeing the people that have the money to pay the check at the end of the meal. We should be concerned with feeding everybody. That’s where my heart is in being involved with an organization like the Foodbank. I’ve got kids, and the thought of not being able to feed my kids breaks my heart. My son is 2½, and he’s a machine — he eats so much, and it’s constant. If I didn’t have the ability to feed him, I don’t know what life would be like. The Foodbank is great to work with because you can directly feel the impact that have on the community. And who knows? I could be on the list of people who need help one day. Life is a crazy game. BF: What we serve will depend on the weather. If it’s warm, we’ll serve a crisp white like our vermentino. That wine is so great with shellfish; it has this briny, mineral character. And being born and raised in this town and knowing lots of people, everyone is looking for my syrah. Maybe Budi [Kazali, of The Ballard Inn] will make his short rib. That’s great with syrah. JW: This year, I am getting two suckling pigs, and that’s gonna be cool for me because at the event up in Oregon that my dad started, every year, one of our signature things was a whole roasted pig. Now, we were in the barbecue business, so we had a smoker big enough that the three of us could have gone in there and sang “Kumbaya.” I don’t have that, but the idea of a whole roasted pig is still there. And I’ve carved myself out as the whole-animal guy here in town. I’ve been consistently dedicated to it. It’s not a gimmick. It’s a way of cooking for me. There’s something to be said in feeding many people off of one animal as opposed to ordering many cases of the same cut to feed the same amount of people. From a sustainability standpoint, it streamlines things a lot. I can say I bought this one animal, and this is how many meals it created, as opposed to buying 20 pork tenderloins. There’s only two per animal, so you killed 15 pigs to make that one case. I’m gonna whole-roast them and butcher them onsite. We’ll have nectarine mustard because we got a fresh case of nectarines and make some of my family’s barbecue sauce.